Research in Motion’s incipient BlackBerry 10 smartphone , code-named London, has a thin and long design, according a photo obtained by CrackBerry.com. While the shape of the London device appears similar to the iPhone 4S (though possibly longer), RIM’s depiction of the device in a slide presentation — “London is about changing the game” may be a more telling description. The photo surfaced yesterday amid a dramatic few days at RIM that began last week with the appointment of Thorsten Heins to replace the company’s controversial co-CEOs. Heins immediately said the traditional enterprise smartphone maker will boost its focus on marketing and the consumer market. 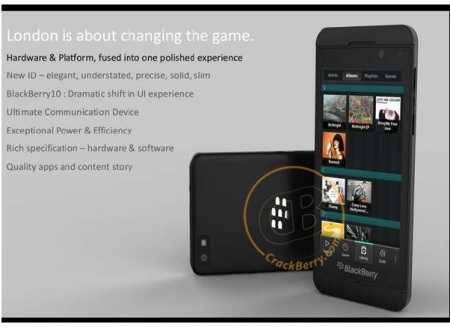 London will be released in the UK, where RIM’s BlackBerry is still the top-selling smartphone, according to CrackBerry. The U.S. has become RIM’s toughest market, where traditional IT shops that deployed BlackBerry devices for years are increasingly allowing workers to use Apple iOS or Android devices on the job. Matt Hamblen covers mobile and wireless, smartphones and other handhelds, and wireless networking for Computerworld. Follow Matt on Twitter at @matthamblen , or subscribe to Matt’s RSS feed . His e-mail address is mhamblen@computerworld.com .